Pop legend Cho Yong-pil to hold national tour to mark his 50th anniv. 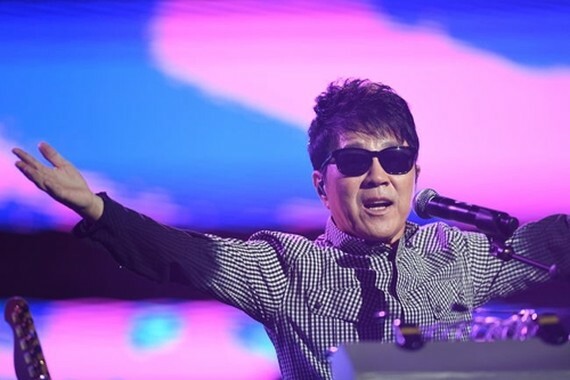 Korean pop legend Cho Yong-pil will hold a national concert tour starting in May to mark his 50th debut anniversary, a civilian committee said Friday. The tour will kick off at the main Olympic stadium in Seoul's Jamsil on May 12 and continue in Daegu, Gwangju, Uijeongbu of Gyeonggi Province and Jeju in the first half of this year, according to the Cho Yong-pil's 50th Anniversary Promotion Committee. The civilian committee launched last month to prepare for the tour and various other events to celebrate Cho's 50th year as a pop singer. The committee consists of experts from various fields, such as academia, performing arts, media and marketing, who love the artist's music. "Since Cho is the sole musician who has remained popular for ages and among all generations and is the icon of our age, highlighting his musical life also has the meaning of looking back at the half-century history of Korean pop music and the era," the committee said in a statement. "Cho is the type of person who rarely reveals himself. People in all walks of life voluntarily gathered their will." Debuting as a member of the rock band Atkins in 1968, Cho skyrocketed to stardom after making a solo debut with the single "Come Back to Busan Port" in 1976. In 1980, he released his first studio album "The Women Outside the Window." The album includes the title track and the hit song "Short Hair," which became the nation's first million-seller. He has since put out 18 more full albums, including his latest "Hello" in 2013, to become one of the most influential Korean pop stars.